Graham, Heather and Mary Margaret have a huge love for dogs. Graham's dog Hogan enjoys joining her as she practices as well as posing in pictures during photo shoots. One of Hogan's favorite poses is lying on his back in Savasana. Graham Williams became a certified Iyengar instuctor in 2006 and opened her own studio in 2008. In September of 2017 Graham passed the JR Intermediate II Certification. When Graham went up for the first level in 2006, the Assessment was broken into 2 parts, Intro I and Intro II: this means that she has now passed four Assessments. Graham has mentored three of her students and helped them to pass the first level, Introductory I/II. Two of the students who passed, Mary Margaret Moffitt and Heather Worrell, are now teaching a weekend class and subbing for Graham when she is out of town. As Graham very well knows, it takes discipline, dedication and a lot of hard work to become certified. She is very proud of Heather and Mary Margaret for their willingness and determination to become certified instructors. We all are very fortunate to help spread the amazing practice of Iyengar Yoga. 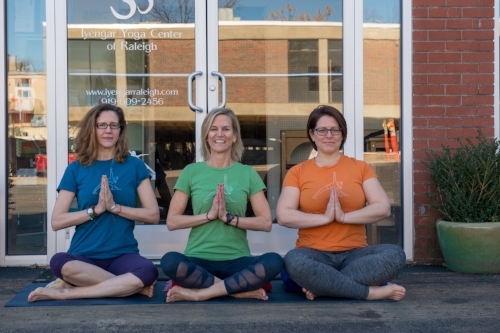 We are serious practitioners at Iyengar Yoga Center of Raleigh however we also enjoy making our students smile, have fun and enjoy each moment of the day.